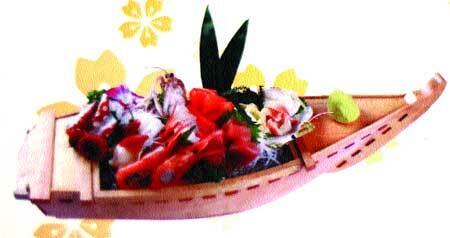 Doing the wave: This boat-shaped sampler features seven kinds of fresh fish. Saigon Sakura offers an expensive but indulgent Japanese dining experience, with sumptuous platters of sushi made from imported fish as well as smaller dishes from the grill and stove. Thanh Ha reports. Located on Hang Bai Street, near the heart of the city and Hoan Kiem Lake, Hoa Anh Dao - Sai Gon Sakura is surrounded by a gentle and quiet atmosphere that adds to the relaxing ambience, even during peak hours. When we arrived at the restaurant, we were quite pleased by the warm welcome we received from the servers. They helped us park our motorbikes and led us upstairs to the second floor. Entering a room decorated with traditional Japanese paintings such as beautiful girls in kimono playing musical instruments, we sat down comfortably on the wooden floor, which features a roomy place for diners to put their legs under the table. On a roll: Age Futomaki, a deep-fried sushi roll. First a server brought us dishes of edamame, boiled fresh soybeans that are a common drinking snack or appetiser in Japan, and sake, Japanese rice wine. While we enjoyed these, several local servers wearing kimono brought us the main courses. They included fresh salmon, octopus, tuna and several other fish imported from Japan (VND900,000). While many other Japanese restaurants in Ha Noi serve imported fish, this seafood tasted remarkably fresh. Chef Ho Hung studied cooking in Japan, from where most ingredients are imported through an official contract. You can taste the difference, he claims. We shared Sakura-sushimori (VND820,000) a platter of mixed sushi that includes prawn, salmon, tuna and cucumber rolls as well as more elaborate hand rolls. Indeed, the sushi was some of the more delicious I've sampled in the Vietnamese capital. While the sushi extravaganza we enjoyed is one of the priciest offerings, the restaurant also serves marginally more affordable fare such as a sushi lunch set (VND240,000-420,000) or soba and udon set (VND140,000-210,000). However, this is certainly no place to dine if you're on a budget, even though small dishes are reasonably priced. Restaurant manager Phan Thi Thiep suggested I try grilled smelt with salt (VND95,000) and grilled Ayu fish with salt (VND140,000) as well as fresh seaweed salad (VND190,000), all popular dishes in Japan. 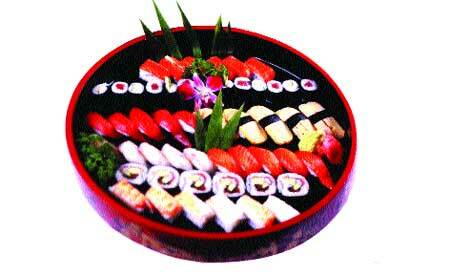 Sushi spread: For big groups, this platter includes several varieties of sushi including salmon, tuna and cucumber.